spillyjane knits: Because you might like to see a new mitten. Because you might like to see a new mitten. Here's more of the new mitten, called Wintertime For Adriana (Ravelry link): It's really coming along well! I'm just putting the thumb in now. I'm in hiding from my Xmas knitting! I don't even want to think about it yet! It may involve lots of lacy scarves! I hope Adriana appreciates how famous she's going to be in mitten form! September 18, 2008 at 7:49 p.m.
September 18, 2008 at 8:25 p.m. I love this mitten!! Love love love love love LOVE LOVE! September 18, 2008 at 10:40 p.m.
September 19, 2008 at 8:32 a.m.
Another lovely design - you are the best! September 24, 2008 at 9:02 p.m. The Swedish Fish pattern is ready! Go on, try the fish! 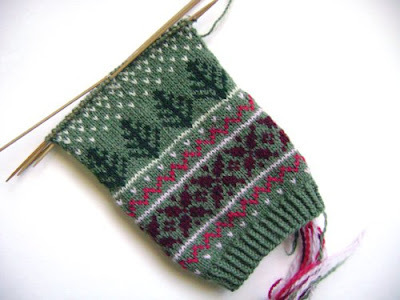 The Willistead mitten pattern is out! 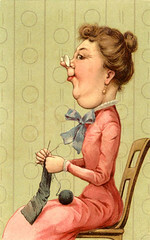 Domovina sock pattern is now available.